Ever wonder why this delicious treat is called s’more? It is because everyone wants some more. Enjoying s’mores, made over a campfire, is a backyard tradition in North America. The tradition of making s’mores goes back to the early part of the twentieth century, and some think may have started with the Girl Scouts. The original s’more recipe is very simple with just toasted marshmallow and chocolate sandwiched between pieces of graham crackers. Today you can find hundreds of variations of this time-tested tradition to try with ingredients like Reese’s Cups, Nutella, lemon, and even bacon. Someone in our house recently tried peppermint patties and loved it. So what do you do when you don’t have a fire pit or a place to build a backyard fire? Well, there are tons of indoor s’more makers but that doesn’t really suit for the veranda. 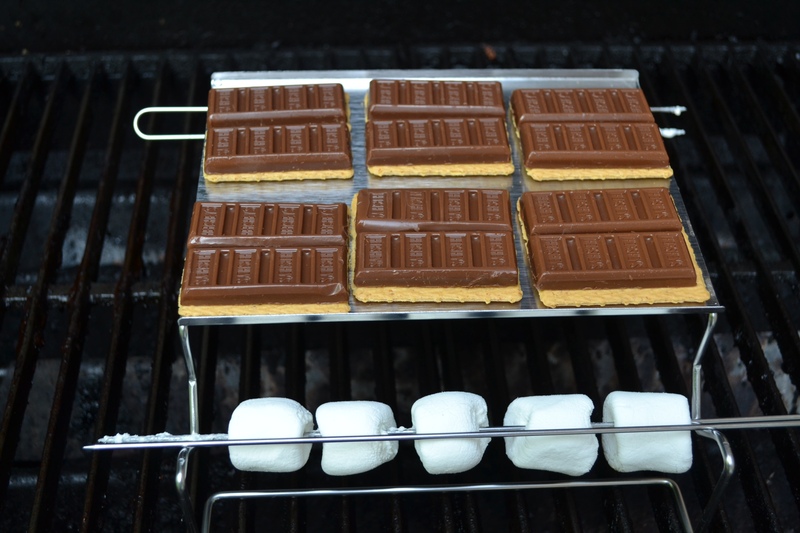 I recently received a s’more maker for the grill – what a quick and easy way to enjoy dessert. Just simply put the graham crackers on the top plate, cover with chocolate or whatever your imagination desires, roast the marshmallows on the rods provided, cook over medium heat until ready, and enjoy! There is even a National S’mores Day – August 10th. Try out some of your own recipes and let us know which is your favorite!